Signature: Bizen Koku Ju Osafune Sukesada. The blade is polished, with a silver habaki, in a shirasaya. Blade length: 31.5cm or 12.40inches. Width at the hamachi: 2.51cm or 0.99inches. Thicness at the hamachi: 0.58cm or 0.23inch. hape: The blade is longer than regular Tanto. Jitetsu: Itame hada and Mokume mix with much Jinie attach. On the surface, light Bizen Utsuri appear. 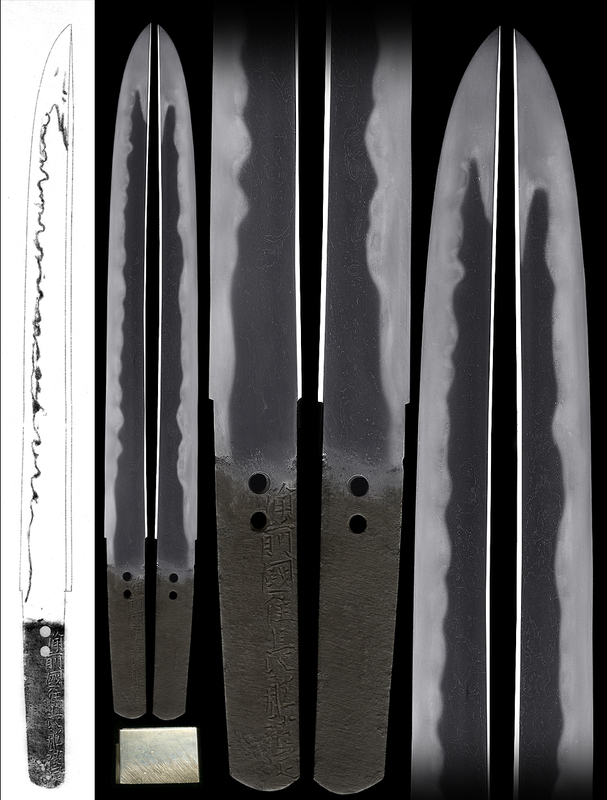 Hamon: Nie-deki, gunome-midare and sharp pointed Hamon mix. In Hamon, there are many ashi and Yo work. At the late Muromachi period, Japan was a turbulent period. Many Daimyo were fighting each other. This Tanto was made at Bizen province at that time. The blade is very active and undulation Tanto. The Tanto accompanied withNBTHK Kityo token Aoi Bijyutu Kanteisyo Whole Oshigata.